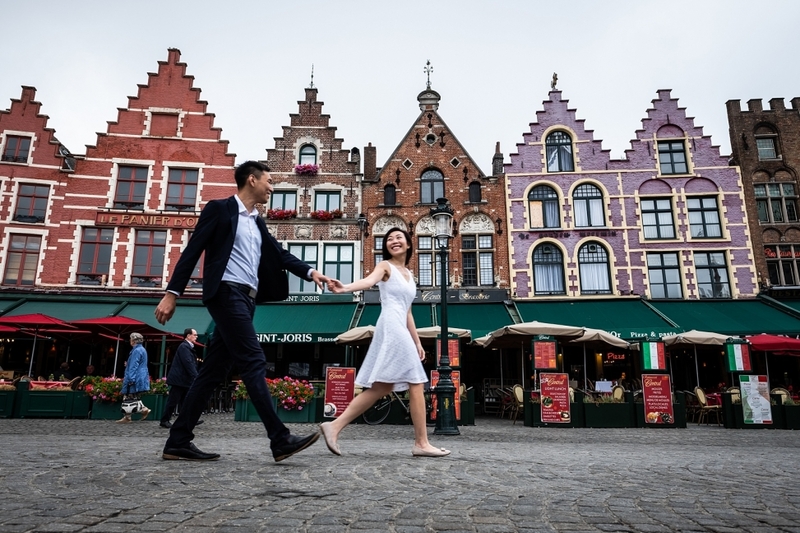 10 Reasons why Bruges is the perfect pre-wedding location – Bruges is the pearl of Belgium and probably one of the most beautiful and romantic cities in the world. It is a fairy tale medieval town with picturesque cobble stone streets, canals, beautiful market squares, historic churches and lots of chocolate and beer shops. The historical city centre is a world heritage site of UNESCO. It is sometimes referred to as the “Venice of the North” because of the numerous canals crossing the city. It is the city of a million photo opportunities and one of the most sought after places in Europe to propose. 1. Bruges is beautiful all around the year! 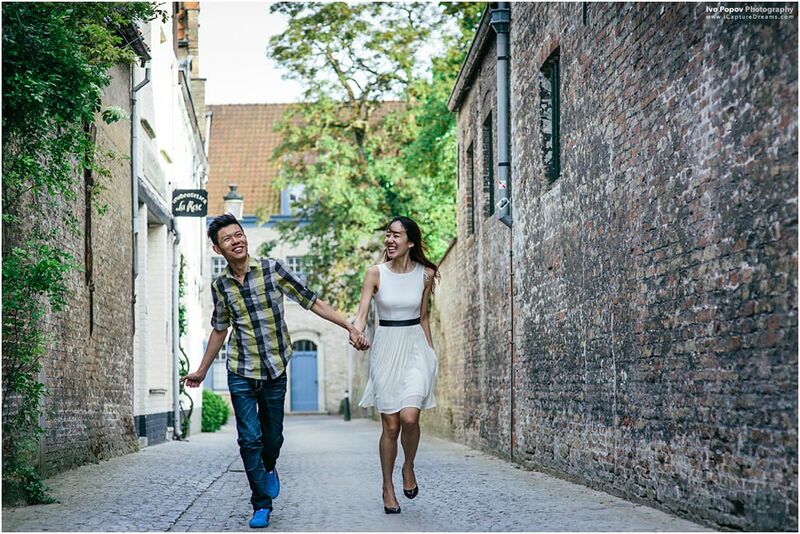 You don’t need to plan your pre-wedding photo session in Bruges in the summer. Spring and fall are beautiful here and even in the winter the weather allows us to photograph outside. 2. It is very well connected to the most major touristic cities in western Europe. It takes less than two hours to go to Paris and a bit more than that to visit Amsterdam and London. Combine them in your trip and it will be unforgettable. 3. No matter where are you in the city, the worlds best beer and chocolate are just an arms reach away! Everybody knows that the best chocolate and beer come from Belgium. So, just stroll around the old cobble stone streets of Bruges and start tasting. You can find some of the most famous Belgian chocolate brands like Neuhouse, Godiva, Leonidas and Galler, but also boutique makers like Dumon, The Chocolate Line and BbyB. 4. Belgian people are very friendly and everybody speaks English. Your stay will be easy and pleasant. 5. Bruges is just mind blowing after dark. You can schedule your pre-wedding session, so park of it is after sunset. 6. Bruges is the home of a few Michelin star restaurants. If you like good food, Bruges has a lot to offer. Yes! The city is filled with great looking restaurants, but for a special gourmet experience head over to one of the Michelin start restaurants in Bruges. One of the best and very centrally located is the famous “Den Gouden Harynck“. Just a few steps away from one of the most beautiful spots in the city – The Bonifacious Bridge, the restaurant will amaze you with its menu, without emptying completely your pocket. Make sure you call to reserve. 7. You can visit the movie locations from the famous movie “In Bruges”. Even if you have never seen the movie “In Bruges” by Martin McDonagh you before you visit Bruges! Great cast (Colin Farrell, Brendan Gleeson, Ralph Fiennes,…) and the 12th century buildings and canals of Bruges are just the perfect backdrop for the story. And it will make you even more excited about your trip! Even if it is your first time in Bruges and you don’t know all the nice spots in the city. Even if you have never taken pro photos before and you are shy and think that you need help with directions and posing. Some people need directions, others are natural. I will adapt to the person in front of me. We will spend two hours walking around the city and exploring the most amazing spots. I will guide you trough this adventure in Bruges and we will do some magical photos together 🙂 Book your session well in advance to be sure your date will be available. I am looking forward to meeting you and doing some magic together! Ivo took our pre-wedding photos in Bruges and he really did an amazing job. Our criteria for the photographer was someone who has good photographing skills and knows the city well, and I must say Ivo is the best in this aspect. All the locations he suggested were so beautiful. We were so surprised when we received the photos from him, as they are way beyond our expectations. He managed to capture our happy moments as well as the scenic view of Bruges. I would definitely recommend Ivo to anyone who wishes to take their engagement/ pre-wedding photos in Belgium. 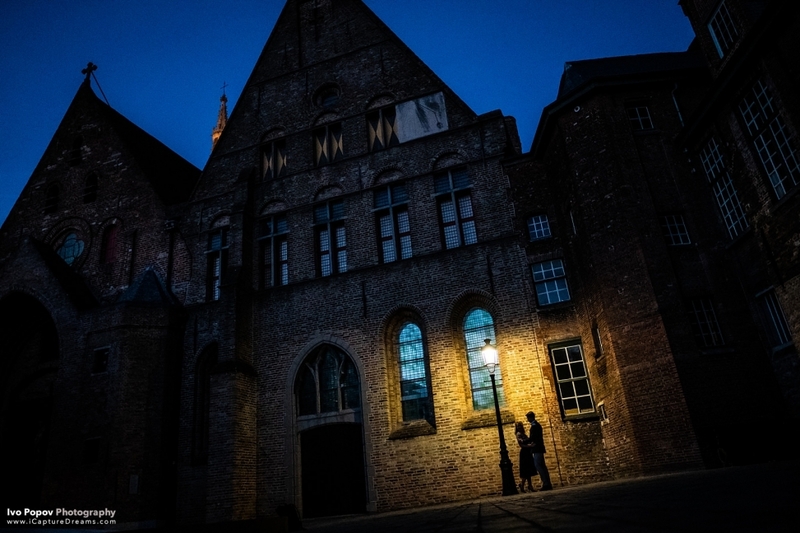 Ivo is truly a brilliant photographer, when we first met him in Brugge, where we took our engagement photo session. Even it was -11 degree and frozen cold out there, he was still cooperative and friendly, and since he knows the city so well so he suggested a lot places and poses for us, we therefore got one of the best set of photos. Thx Ivo! My sister and brother in law are also extremely happy about the photo session you shoot for them in Paris, brilliant! Ivo is truly a phenomenal photographer! His brilliance showed in our wedding photos. He made us feel comfortable and really caught the beauty of our wedding. Ivo vision captured all of the ceremony and reception in so much detail that it is hard to believe that one person can capture so many amazing photos. We can’t stop smiling when we look at his work. We are so thankful to have found someone like Ivo to trust and rely on. He made working with him overseas a very easy process. I would recommend Ivo to anyone for any occasion in a heartbeat.! Ivo was everything we wanted in an engagement photographer. He is very responsive and easy to work with. We are Americans and our vision was to have the backdrop of our photos to be quintessentially Bruges because In Bruges was one of the first movies we watched together. Ivo totally delivered and took us to all the iconic spots. Because we are foreign, he even taught us a bit about the culture in Belgium and recommended excellent lodging and restaurants. He is really good at getting the overall proportions of photos right (how people should fit in the frame of the background), emphasizing on the beautiful scenery and backdrop. As for the people in shots, he provided standard poses for us to do (you can see some on this fb page) but he also listened to what we thought our best angles were and incorporated some of that into our portfolio. I am a tough critic when it comes to judging how I look and Ivo has made me feel beautiful in many images. 10. 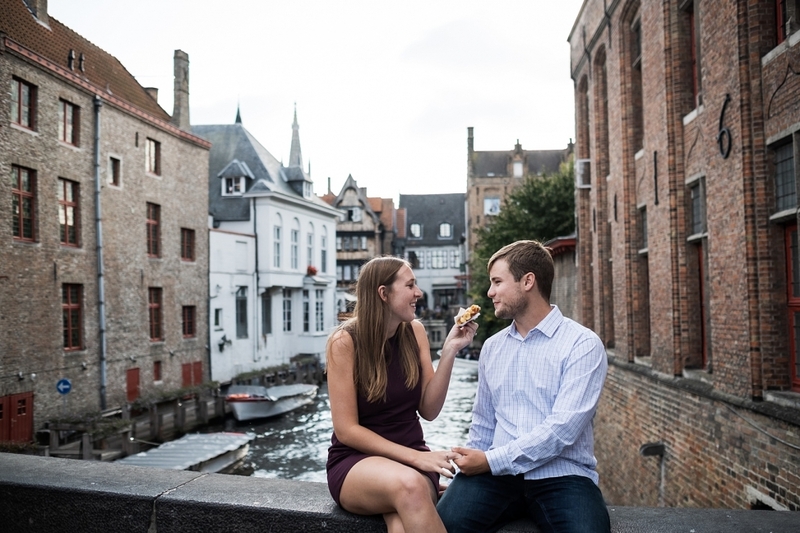 Not that you need more reason to choose Bruges as a location for your pre-wedding photo shoot, but you can eat the famous Belgian fries all day long!! Take away or as a side in a restaurant, they are everywhere and they are delicious! !